Thank you for these solid tips mr Salmon! Good to know. The only possible point of contention would be the bringing of omiyage/tenugui. When I was arranging to visit two dojo in Osaka, I asked if I should bring a small “thank you”, but was told that this would be overkill and that doing so was not normal. Good point, but if you ask beforehand the polite answer is bound to be “no don’t bother”. It is not a major issue if you don’t, but it makes a good impression if you do. Why as a guest should you line up with the most senior motodachi? Is that supposed to afford them respect? Because usually that’s the longest line and I would have thought as a guest you should be at the opposite end so as not to be perceived as trying to jump ahead of people in the home dojo (somewhat similar to lining up at the beginner side until told to move up). 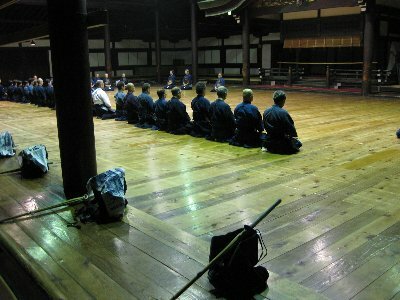 By starting with the most senior person you are showing respect to them and to the dojo. If you have to queue, so be it. You may also learn more from one practice than you might with many more people at the lower end. When I lived in Japan, the rule of thumb in my dojo was that with waiting time you could manage 4 practices with hachidan or senior nanadan in an hour against 10 keiko with other grades. The serious guys always went for the first option. Thank you Sensei for this post, am going to France this week and will be training at 4 different clubs while am over there, so this blog post came just in time.